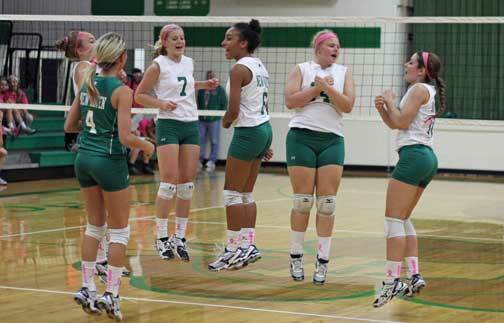 New Haven's Junior Varsity picked up their 21st win on Thursday, defeating St. Clair in two sets, 25-13, 25-17. Many things have changed at Hermann High School but one remains the same. 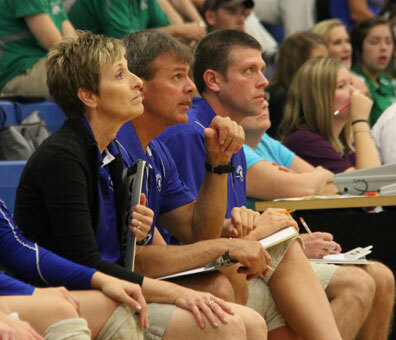 Every volleyball the same two people have sat next to each other for the past 33 years, Head coach Linda Lampkin and Assistant coach Allen Speckhals. Hermann, Mo. 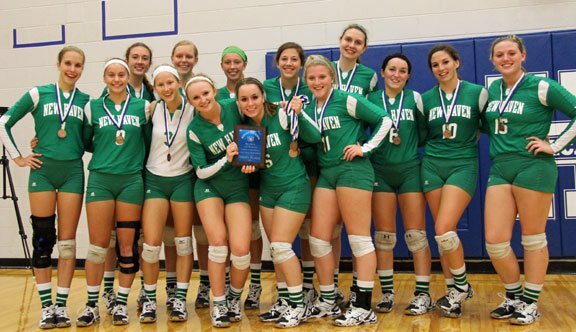 - In Missouri, the name Linda Lampkin is synonymous with high school volleyball. Throughout her 33 years of coaching at Hermann High School, Lampkin has become an iconic figure within the Hermann community and across the state of Missouri. On October 1st Lampkin picked up her 800th career win in their first game of pool play of their annual volleyball tournament, becoming the first Missouri high school volleyball coach to ever reach 800 wins. While players have come and gone since she began her coaching career in 1979, one constant has been her assistant coach Allen Speckhals and together they have formed a dynasty. One that will never be matched during our lifetimes. New Haven, Mo. - In Monday night's Four Rivers Conference match, Taylor Covington's career high of 17 kills helped New Haven (19-10, 4-1) knock off Pacific (8-13, 2-3) for the second time this year in three sets, 25-20, 23-25, 25-9, picking up their third straight win and second behind Hermann (5-0) in the conference standings. The headline from Monday night's FRC action is the Junior Varsity's "El Perfecto" streak remains intact after their two set win, 25-16, 15-16, picking up their 20th straight win, improving to 20-0, 5-0. What is even more impressive is the JV have lost just three sets, two of them to Hermann and one set to Fatima. Dating back to last season, JV Coach Dennis Carey's teams have a combined record of 42-3-1. Hermann, Mo. 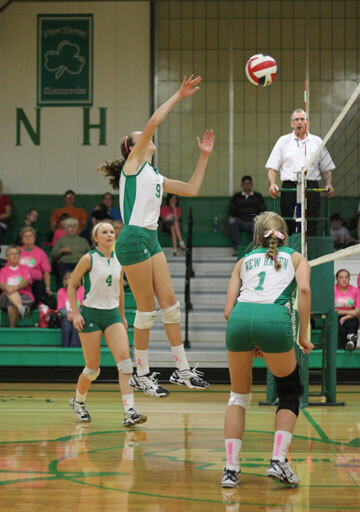 - New Haven entered Thursday's third place match in the Hermann Volleyball Tournament having lost three of their last five games and a lose to Pacific would be detrimental with only two weeks before districts. But New Haven's three set win over Pacific to take third place may have been a pivotal turning point in their season and exactly what they needed confidence wise as they head into the final weeks of the regular season. Watch the semifinal match, New Haven vs Borgia as well as the third place and championship matches. Game final: Borgia wins in two sets 25-17, 25-14. It was all Hermann Tuesday night as they went 6-0, picking up Coach Linda Lampkin's 800th career win. Like Us on Facebook for more photos from Tuesday night. Hermann, Mo. 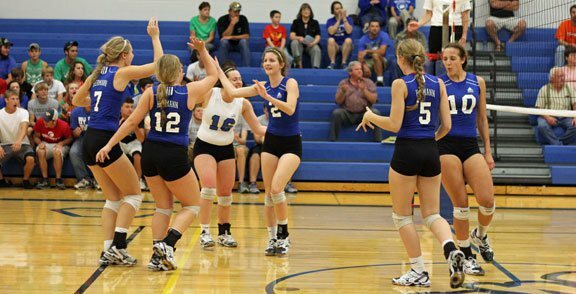 - Tuesday night ended with Hermann taking the number one seed in their pool by beating New Haven in both sets, 25-17, 25-22. Hermann plays Pacific on Thursday (#2 from Pool A) in the championship bracket at 6 p.m.
New Haven (#2 from Pool B) will get another shot at Borgia (#1 from Pool A) after taking them to three sets less than two weeks ago, when the lady rocks were inches from pulling off the upset. Assistant Coach Phil Landolt hands Head Coach Linda Lampkin the game ball after winning her 800th career win. Below you can watch the final points and Coach Lampkin's reaction. Hermann, Mo. - Moments ago, at 4:53 p.m., Hermann High School Head Volleyball Coach Linda Lampkin picked up her 800th career win, defeating Owensville 25-21, 26-24, making her the first coach in the state of Missouri to ever reach 800 wins, making her the all-time winningest coach. 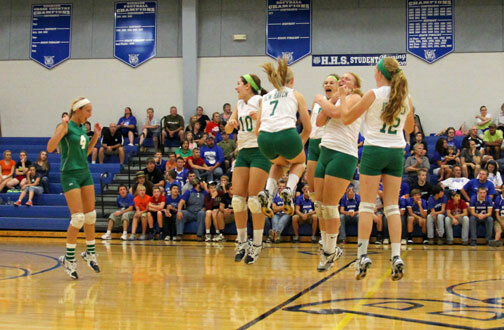 Lady rocks go crazy after Trista Kormeier's game winning ace gave New Haven their 16th win of the year, defeating Hermann in three sets last Thursday. New Haven's JV volleyball team entered Thursday's conference match at Hermann a perfect 15-0 and playing the same team they beat in a three set match to win the Pacific Tournament just five days before. Earlier in the week New Haven knocked off Borgia in two sets on Monday then picked up their first conference win over Union the following night, improving to 15-0,1-0.